This may come as a surprise to y’all but I am not known for my patience. Yup, big shock that one. It may be the ridiculous amounts of sugar I consume (much like a hummingbird) but the ability to wait patiently and not race ahead was left off my personality traits in favour of mad breakdance skills and improvisational rhyming. So it still befuddles me to this day why I thought self quilting a pair of long sleeves would be a great idea when making my first sweatshirt… Oh, wait- it’s because it makes things look all kinds of rad! Say hello to the insanity inducing self quilted sleeve wonder of my 2015 wardrobe. 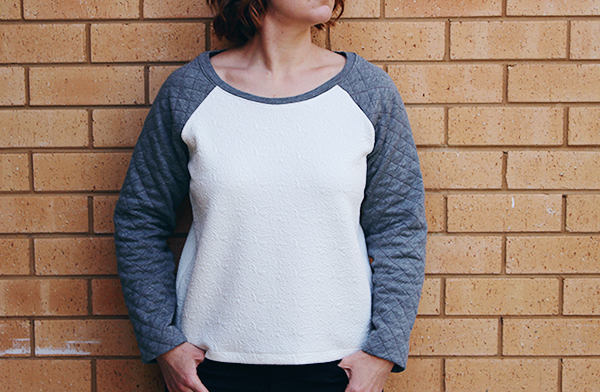 This bad boy is the Linden Sweatshirt by Grainline Studio. It features a relaxed fit, raglan sleeves, and a slightly scooped neckline with options for sleeve cuffs and a waistband. As winter has hit with a bang in the Berra already (-7 on the way to the gym = sad frozen panda) it is time to be making up snuggly pieces. I went with View A but lengthened the body and sleeves by 4cm and removed the sleeve cuffs and waistband. Sassy! The body of the Linden is made up from some white faux quilted poly spandex blend scored from Darn Cheap Fabrics. But let’s talk sleeves. These bad boys are made of a Marc Jacobs terry knit remnant from The Fabric Store scored for $6 back in 2012. I’m not sure where the idea to quilt came from (too many G&Ts or perhaps not enough?!) but once it was in my mind I had to go with it. Given my vast (read: zero) quilting knowledge it is quite surprising how well this turned out. I got some advice from Addicted to Fabric and bought some thin but squishy cotton batting. It was then time to make a delicious Marc Jacobs knit sandwich by roughly pinning everything together. To get the line spacing even and make it easy to follow I used painters’ tape stolen from our house painting kit and measured diagonal lines 1” apart. Then came the first batch of stitching beginning from the middle and working out. This required a walking foot, an audio book, patience and several wines. Due to my attention span rivalling that of a squirrel on uppers the quilting was broken into 20 minute chunks to get it completed. Once the first batch of stitching was done the fabric was re-taped on the cross diagonal and the sewing started again. Let me tell you there was some seriously exuberant dancing when this was all finished. Nothing says completed quilting like a pop and lock. Bam! Construction wise everything was very straightforward and it went together easily. This pattern was sewn up at Sewaway surrounded by 13 other rad sewing ladies and the fact it came together without problems is a testament to how well it is drafted. Mainly because I was making raptor noises at everyone while sewing. And then providing alternate commentary to Jurassic Park. Because that’s what I bring to sewing catch ups: pure. class. The comfy fit. This is another stealth PJs pattern. Mmm ninja comfort! How quickly it went together. Except for the quilting. Never again. Go down a size. I ended up removing a good 1.5” on either side seam and up into the arm. This isn’t a sizing issue from Grainline just my preference to a more fitted look. Pinch out a couple of centimetres from the back neckline. There’s sometimes a draft onto my back meat and that’s not rad. Overall, I am so happy with how this turned out! I’m looking forward to this becoming part of my winter wardrobe with some black skinnies and my ubiquitous Chucks. But enough casual clothes- Frocktails is on in two weeks and I need to start my ensemble STAT! Wish me luck- eep! I love it! I’ve been wanting to do some quilting like this for a while. I’m glad you mentioned about the fabric not being stretchy after quilting – wouldn’t have thought of that! Oh how I missed seeing your raptor hands in operation at Sewaway! This is fabulously glorious & snuggly – I suspect I’ll need one for a -7C coffee in Canberra then! brrr… you berra lasses are made of stern stuff!! I missed you too, Nic! 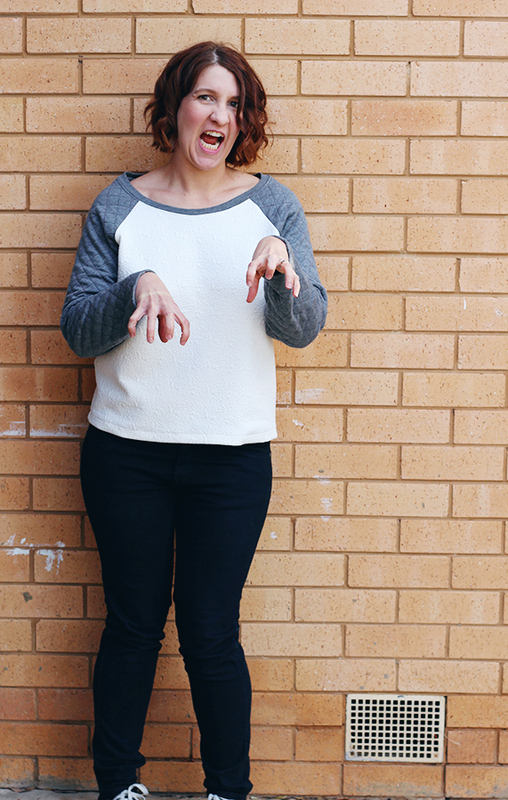 We’ll have brain cocoa to keep you warm in the Berra! Ahhhhh yes. I read your quilting story with several sympathy nods having quilted just the shoulders of my Ziggi jacket & a panel in my Manhatten skirt. It’s a long arduous task… think dinosaurs surviving the ice age stuff. Ohh, I bet the Ziggi looks amazing with quilted shoulders! I am one who likes a wide neckline (think Moneta and Nettie) so this is right up my ally but I can totally see it bothering peeps. Go the hoodie! Thinks out definitely won this battle! You showed that pattern whose boss. The quilted sleeves are amazing. Totally worth the trouble.i have this one on my winter see list. Hopefully I can get it done now I’m on uni break. It’s a definite winter wardrobe win- I’ve been wearing it a bunch! Well it was worth the drudgery! I nearly bought some of that poly fabric in a flaming red today…. You like it? Ohhh, we could be total twins! Do eeeet! This looks so great!! I quilted a project once, and I was all how hard could it be, it’s just a few straight lines, but it too FOREVER! Anyways totally work the extra effort! I so hear you- how hard could it be then ALL THE TIME CONSUMING! Love it! Especially the quilting (really never again? but it looks so good) and the no bands on the hem and sleeves. Can’t tell if I’m more impressed by your patience or your colour choices. 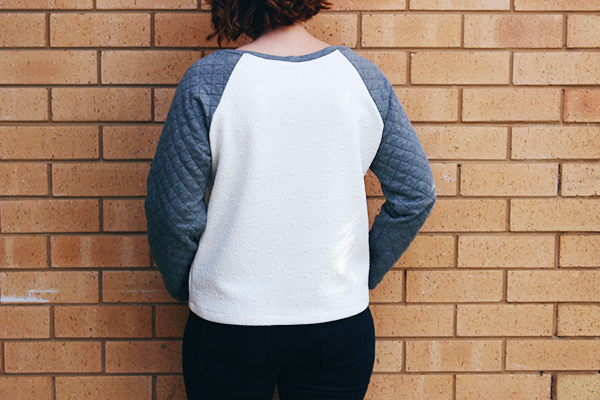 How do you make white + grey look so good?! Good god woman, you’re a genius! Whoa girl you got some patience after all! This is why I’ll probably never make my husband the quilt he’s been asking for..poor guy. This turned out really well! A whole quilt?! Eep! Distract him with Vito’s cuteness! You had a letterman’s jacket?! This has made my day! and toasty wearing this, which is excellent for those chilly nights out in town.